Looking for a deep, therapeutic massage with a gentle touch? You are in the right place. I have spent 15 years honing my touch to pr﻿ovide a massage that is both soothing and healing. By applying slow, targeted pressure the muscles release in their own time, reducing discomfort and allowing you to slip into your "Zen" place. Whether you are suffering from chronic pain, recovering from an injury, or just need to unwind, I can meet your needs. Thank you so much for visiting my site. In order to meet the needs of my current clients I am not accepting new clients at this time. Please check back in a couple months as this may change. 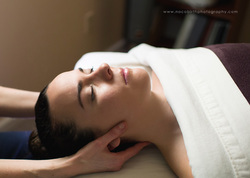 Massage is a wonderful way to melt away stress and let go of deep rooted tension and pain. Each massage is tailored to your specific needs. Swedish relaxation, trigger point, deep tissue, and neuromuscular techniques are skillfully integrated to unwind tightly bound muscles leaving you feeling relaxed and rejuvenated.